Ooops I did it again. Indeed. 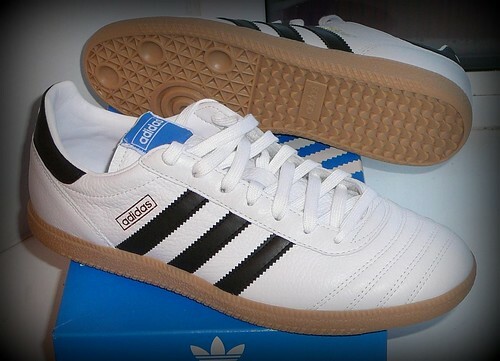 Anyways, here we have a another reborn classic Adidas shoe released under the Adidas Originals brand. The Samba JP Leather, inspired by the legendary Samba football boot, this shoe takes the classic soccer detailing, blends it with today’s street style and throws it back in your 21st century face. I know! Wonderful, are they not? 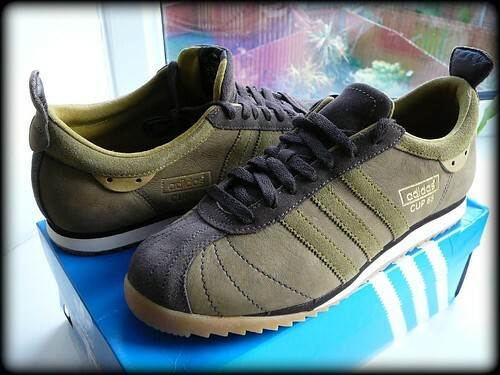 Adidas Cup 68 in Brown, Ventura and Gum. An update on the Chile 62 shoe, sporting the same pull-on tags and side tabs. Sadly, you cant see the soles which feature the most fantastic looking fake green studs. I wore them last night and I’m offically saying sorry to anyone that thought I was rude! I wasn’t ignoring anyone or avoiding eye contact, It’s just that I spent so much time looking down at my shoes! If I’m taken by any one thing in particular it’s the gum sole, I love it, its so retro and so perfect against the green upper. Tell me you love them too!